When Joseph Jaramillo retired from a twenty-six-year career at the Southwest Indian Polytechnic Institute, he returned to the land that his family had owned and farmed for generations. He has fond memories from childhood of helping his grandparents on their farm. As an adult, he continued to assist his father, who worked the land on the western banks of the Rio Grande on Isleta Pueblo to which he has returned. “I’ve always had that embedded in me,” says Jaramillo about his inherent connection to agriculture. However, interest in agriculture has declined on the pueblo for more than a generation, so growing blue corn was much easier said than done. There is blue corn, and then, there is the right blue corn. As Jaramillo explains it, sweet corn or “dent” corn are common varieties high in sugar that sport a small crease on the top of the crown. This is due to the high level of sugar contained in the kernel that condenses when dried. Traditional blue corn, however, contains much less sugar and the kernel retains its rounded shape. That first year, Jaramillo was able to gather a variety of seeds from around the pueblo. He planted small plots of each, and at the end of the season, took his corn upstream to the mill at Santa Ana Pueblo. When roasted, traditional blue corn will remain perfectly edible, whereas sweet corn will harden to the point where it is impossible to eat. 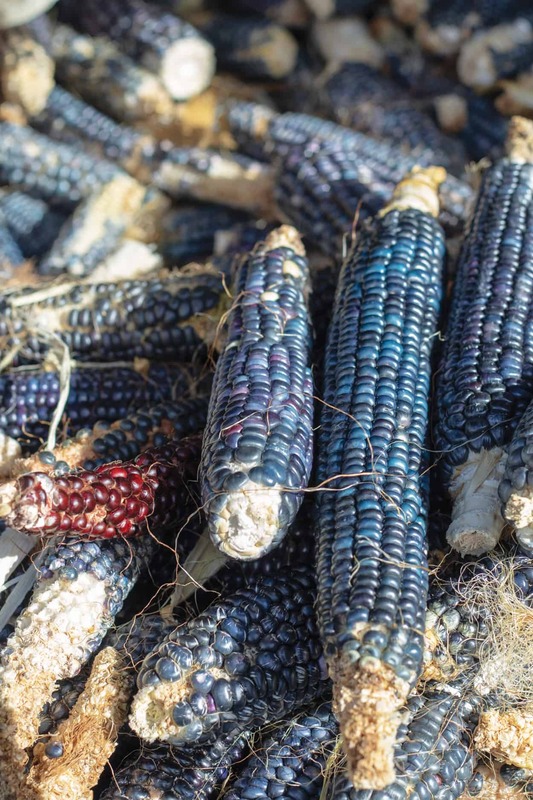 Luckily, one of the varieties turned out to be the corn he was seeking, and since then, Jaramillo has proudly grown the blue corn he remembers from his youth. Jaramillo has been growing blue corn for thirteen years, but his larger goal of inspiring an agricultural revival has been slow to develop. 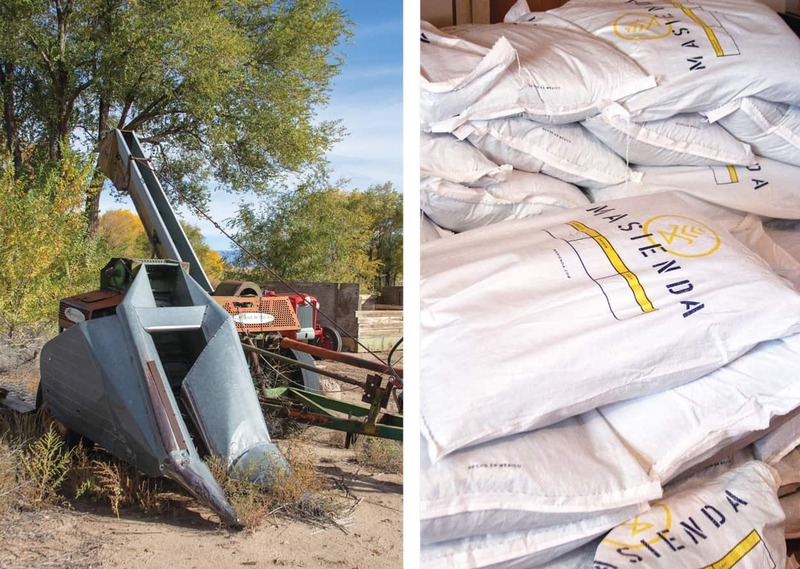 That doesn’t mean he’s lost hope, and since 2016, the New Mexico Landrace Corn Project, a new organization focused on promoting sustainable, organic agriculture through heirloom corn, has provided a new outlet for this revitalization to take hold. Left: Jaramillo’s single-row picker for harvesting corn. Right: Bags of Masienda blue corn waiting to be planted on Jaramillo’s land. From his position with New Mexico State University’s extension service, Vos started reaching out to farmers across the state, and his efforts quickly began to generate interest. Rick Schneiders, former CEO and chairman of Sysco Corporation, who now lives in Santa Fe, had read the same article and was also in the process of figuring out how New Mexico could be involved. He had been in contact with Masienda’s founder, Jorge Gaviria, who jumped at the idea of including New Mexican farmers. “I could just hear his excitement over the phone,” recalls Schneiders. Like Jaramillo, Vos and Schneiders initially had trouble finding the correct blue corn seed. They eventually met a couple of farmers growing traditional blue corn on Santo Domingo Pueblo, and Masienda agreed to buy four hundred pounds of seed that they would give away to farmers while maintaining the first right of refusal to purchase their corn at the end of the year. By this point, Vos and Schneiders realized the endeavor was going to require more effort than expected. So, they formalized their vision as the New Mexico Landrace Corn Project (NMLCP)—landrace referring to locally adapted varieties that have evolved through centuries of traditional selection by small-scale farmers. In 2017, Vos recruited eighteen growers, including Jaramillo, who were able to plant up to a total of two hundred acres of the blue corn from Santo Domingo. Some of these farmers were in the middle Rio Grande Valley, but others were spread from Anthony (east of Las Cruces) to Farmington. Due to a number of factors, that first year produced mixed results. While they had expected to be able to give farmers the seeds and let them do the rest, Vos and Schneiders quickly learned that they would have to be much more hands-on. “In agriculture in general, a lot of the skills have atrophied here in New Mexico,” says Schneiders. This meant that a lot of their time was spent teaching newer farmers how get their operation up and running. There were also environmental factors to contend with. The corn planted in the middle Rio Grande Valley did well, but Farmington experienced an early frost that ruined a number of acres. In Anthony, higher temperatures proved difficult for seed that had adapted to the slightly cooler climate of the middle Rio Grande, and yields were much lower as a result. Overall, NMLCP sold 15,000 pounds of corn back to Masienda, keeping 3,000 pounds to plant in 2018. Farmers also kept a lot of corn for themselves. Some sold or gave away part of their crop to neighbors. Others found local markets that paid more than Masienda. For Jaramillo, much of his corn went to his own products, which include parched corn, corn flour, and cornbread and pancake mixes sold under the label Native Naturals. Some farmers also kept a portion of their corn to be used in religious ceremonies. In 2018, with more than seven times as much seed as they had the first year, NMLCP was ready to scale up. They had planned to enroll many more farmers, plant many more acres, and send many more tons of corn back to Masienda. Unfortunately, the small snowpack and extreme drought meant that very few acres were planted. Jaramillo, himself, planted just slightly more than an acre. One point of progress was that NMLCP was able to find a landrace variety of white corn better adapted to heat that some farmers in Anthony planted. Blue corn grown in 2017 on Jaramillo’s land. For Schnieders and Vos, the timing of New Mexico’s driest year in more than a century could not have been worse. Early reviews of the corn had been extremely positive. “It tastes fantastic,” says Vos, who received good feedback from local chefs interested in purchasing future harvests. The forced time out has also provided an opportunity to better plan how the Corn Project will take shape going forward. One of the limits for small to mid-scale farmers is their ability to harvest at the end of the year. Some farmers still pick by hand. Jaramillo uses a single-row picker that harvests the ears. He then has to use a different machine to shell it, which takes more time than modern combines that pick and shell the corn at once. To expand their capacity, Vos is considering having NMLCP purchase a small combine that could be rented or loaned out to participating farmers so that they can harvest more acreage. The first year, Vos and Schneiders were fairly easygoing about screening farmers for the program, but as they discovered, some farmers did not have the skills or the tools to succeed. “There’s nostalgia around farming,” says Vos, “But they might not have the resources to get the farm going where it can be commercially viable.” Part of the role that NMLCP will ultimately play is to help farmers develop the skills or acquire the necessary equipment to succeed, but for 2019, they plan to focus their resources on model farmers like Jaramillo, whose farms are already viable, and who they can trust will produce a good crop. Because of this, for Jaramillo, NMLCP and Masienda are a means to an end. “I really appreciate what they’re doing,” he says. “It could turn into something really big.” For him, education is the missing link that could help renew interest in agriculture on the pueblo and he believes that Masienda and the Corn Project could help open a door for people potentially interested in getting back in the agriculture. At the same time, he is reticent to hand over control of his business or farming practices to an outside entity, especially when it comes to which crops he plants or how many acres he seeds. For their part, Vos and Schneiders are conscious of the potential controversy that commodifying a sacred crop could engender, and as they move forward they will work to ensure the goals of NMLCP and their farmers continue to align. Next year’s growing season could have a large impact on the Corn Project’s future, but that hasn’t stopped them from already thinking long-term. Currently, all of the corn that NMLCP’s farmers produce is sent to Chicago to be cleaned, processed, and nixtamalized. With sustainability as a goal, Vos has started to look into the prospects of building a processing plant in New Mexico so that much of that work could be done locally. They have also started to think about ways to increase blue corn’s per-acre yield to make it more profitable, as well as ways to expand to other heirloom and landrace crops including wheat, barley, and beans. But for now, their focus is to increase interest in small-scale agriculture and make sure it’s also profitable.